No more page reloads: The new version is active immediately after installation on pages that are already open in the browser. The previous version only applied to newly opened pages, which created a bit of confusion for new users. Also, configuration changes apply immediately to all pages, so no need to reload pages after customising the menus. How to install and use Bug Magnet? How to contribute and support development? Firefox support: The FireFox extension is now fully rewritten from scratch to bring it up to speed with the Chrome extension, and it’s now using the same code base, so the features are the same. The extension works with the latest FireFox 57 (Quantum). 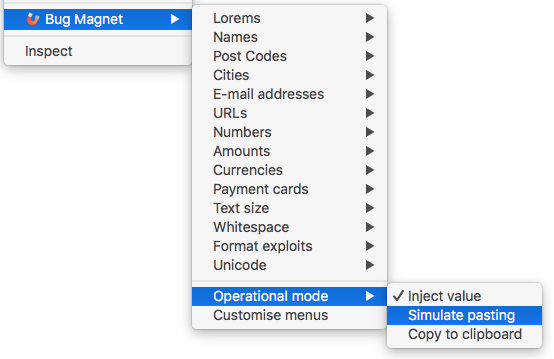 Clipboard integration: You can make Bug Magnet just copy values to your clipboard, to easily try out the edge cases in apps outside the browser, or on web sites that use custom components so direct value injection would not work. Deploy common configuration easier: The old extension allowed users to select a local file with custom menu options. That was tedious if you want to deploy it to a whole team, as people had to copy files to individual machines. The new extension has two more ways of adding configuration – from a remote URL and directly pasting in a JSON file. Remove standard stuff: For users that would like to completely use their own menu structure, you can remove standard options. Click the Customise menus option in the Bug Magnet Menu, then tick the Hide standard menus box. Pack your own version easily: Bug Magnet now uses webpack to link everything together, moving away from custom packaging scripts, so it is much easier to pack your own version and deploy to the whole organisation. Check out the Developer Guide for more information. No more scary permissions: Bug Magnet no longer needs full access to full content on all pages, so no more horrible warnings at the start. The extension also no longer stays running in the background, but instead connects/disconnects from your page after every click. Existing users can uninstall the previous version before re-installing the upgrade to make sure any previous full-access permissions are revoked. Develop and test easily: The code is updated to ES6, using Webpack and ESLint that should make it easy for new people to contribute and build their own versions. We use Testem and Jasmine to run tests in Firefox and Chrome directly. The Developer Guide is updated to list how to achieve all common development tasks, such as running tests, troubleshooting test failures. Check out the Github Repository for more information.